Kargari, M., shayan, M. (2017). Identification of parameters affecting the success of the hospital information system & presentation of a model for user satisfaction improvement. 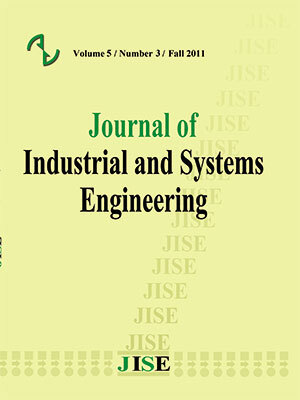 Journal of Industrial and Systems Engineering, 10(special issue on healthcare), 1-9. Mehrdad Kargari; mohammad shayan. "Identification of parameters affecting the success of the hospital information system & presentation of a model for user satisfaction improvement". Journal of Industrial and Systems Engineering, 10, special issue on healthcare, 2017, 1-9. Kargari, M., shayan, M. (2017). 'Identification of parameters affecting the success of the hospital information system & presentation of a model for user satisfaction improvement', Journal of Industrial and Systems Engineering, 10(special issue on healthcare), pp. 1-9. Kargari, M., shayan, M. Identification of parameters affecting the success of the hospital information system & presentation of a model for user satisfaction improvement. Journal of Industrial and Systems Engineering, 2017; 10(special issue on healthcare): 1-9. Complex institutions comprising several divisions and departments such as hospitals need access to information. Hospital information system has many capabilities and in case this system is acceptance by hospital staff, it leads to a revolution in the health care delivery industry. The identification of effective determinants and measures on the success of hospital information systems could significantly lead to the improvement of their performance. In this paper, the effective determinants and measures on the success of hospital information systems have been identified and then the data has been collected with the help of two customized questionnaires and finally analyzed with inferential statistics using SPSS software. According to the questionnaires, the results of the collected data were divided into two groups: results of experts and those of system users. In the experts group, after identifying the measures and determinants from the literature, they were presented to experts and with the use of one sample T test, the influencing measures and determinants on the success of hospital information systems have been identified. These measures were provided to users and then the confirmatory factor analysis was performed to assess the validity of questionnaires and structure of the identified determinants from the users’ opinions. Finally, several linear regression analyses were conducted to examine the hypotheses and proposed a model to improve user satisfaction in hospitals. Ahmadi, M. Rezaei, P. & Shahmorady L. (1387), Electronic Health Records: structure, content and assessment, Tehran: Jafari Press. Borovits, I., Neumann, S. (1979), Computer Systems Performance Evaluation, Lexington Books, Massachusetts: D. C. Heath and Company. Delone WH, McLean ER, (2003), The DeLone and McLean Model of Information Systems Success: A Ten-Year Update, Journal of Management Information Systems, V. 19 No.4, pp.9-30. Davis, G. B., Olson, M. H., (1989), Management Information system:Conceptual, foundations, structure, and development, 2nd ed., New York: Mc Graw-Hill. Hamborg KC, Vehse B, Bludau H., (2004), Questionnaire Based Usability Evaluation of Hospital Information Systems, Electronic Journal of Information Systems Evaluation, 7(1):21-30. Ismail, A. et al. (2010). The Implementation of Hospital System (HIS) in Tertiary Hospitals in Malaysia: A Qualitative Study, Malaysian Journal of Public Health Medicine 2010, vol. 10, no. 2, pp. 16-24, 2010. McLean, E. R. (1973), Assessing returns from the data processing investment, In F. J. Gruenberger (Ed. ), Effective vs. Efficient Computing (pp. 12-25), Englewood Cliffs, NJ: Prentice-Hall. Murdick, R. G., Munson, J. C. (1986), MIS Concepts & Design, 2nd ed. London:Primtice –Hall. Kumar Gupta Shakti, Sunil Kanti Col, Chandrashekhar R, Satpathy Sidhartha, (2007), Modern Trends in Planning and Designing of Hospital Principles and Practice, First Edition, New Delhi, Jaypee Brothers Medical Publishers (P) Ltd.
Seddon, P. B., Kiew M. Y. (1994), A partial test and development of DeLone and McLean’s model of IS success, Proceeding of the International Conference on Information Systems, Vancouver, Canada, pp 99–110.